Your name is Fiona Belli and after waking up from a car crash you find yourself trapped in a Gothic Castle that you later learn is yours. So why on earth are you trapped there? Who is the deformed handyman and evil cook that seem intent on chasing and killing you? 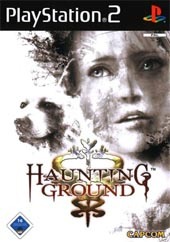 If these questions, along with a ton of puzzles and a dog that you save are enough to intrigue, then Haunting Ground just possibly might be a title for you! 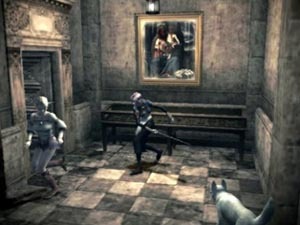 The game does involve a few shocks here and there and for the most part plays out like quite a few Capcom titles that are on the market, but the nice thing is that at least this time there are not weapons scattered all over the place like mad things. You simply have to be clever and run, hide and occasionally there will be a very small time explosive that you can hurl in the way of your enemies. Something to be aware of is the clever fact that the closer that Fiona ends up to her captors, the more she becomes ungainly as the horror of her situation threatens to overwhelm control of her legs. You can hide under objects, in shadows and numerous other places during the game and if you are quick enough and the bad guys don’t spot you, you can get back out and creep away to keep on going with the game. Make sure that you are on the ball throughout this game as those who are not aware of how Fiona is going throughout the game will surely perish quickly. She must eat to maintain her stamina and also make sure that she is keeping Hewie the dog under a close leash as well. If you do not make sure that the dog is doing the right thing all the time and discipline accordingly, you will potentially lose a great ally who can access all the places that you cannot. The graphics and audio on this game are pretty sweet and the sounds really immerse players into the game. The graphics look cool, although a little bit on the airbrushed texture side. The castle looks sensational and is very gloomy and gothic in its overall appearance. The gameworld is truly fascinating and with over 130 rooms in the castle, it certainly makes for an engrossing experience. 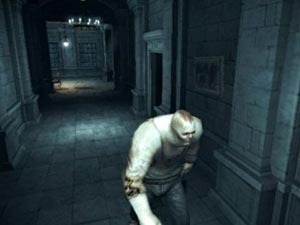 Whilst the game has many elements in it that are samey when compared to other survival horror titles, there are enough bits and pieces that make this title worth the play. Give it a shot.